Cut 1/4 cup cold butter into small cubes. Combine butter cubes with Kodiak Cakes Buttermilk Power Cakes Mix in a food processor and pulse 5-8 times, until butter is cut into pea-sized pieces. Add salt, honey, and buttermilk. Pulse until the dough forms a sticky ball. Add shredded cheese and diced jalapenos. Pulse just until incorporated. Carefully remove the blade from the food processor. If jalapenos aren’t evenly distributed throughout the dough, use your hands or a mixing spoon to gently fold them in until evenly dispersed. Scoop up the dough using a small ice cream scoop (3-4 tablespoons) and drop onto a greased or parchment-lined baking sheet. Will make 12 biscuits. Bake for 5 minutes. Cover with tin foil and bake an additional 10 minutes. While baking, melt 1 tablespoon butter in a microwaveable bowl. Mince garlic into bowl and stir gently to combine. 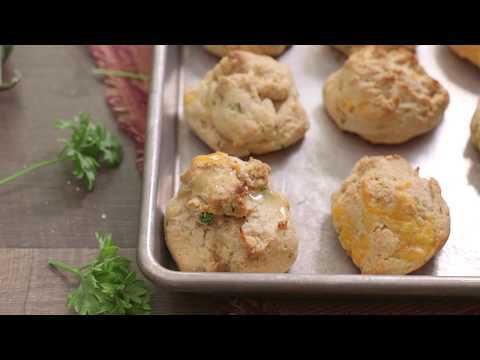 When biscuits are baked, remove from oven and immediately brush garlic butter on top of each one.